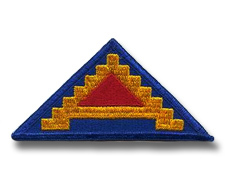 The 210th Field Artillery Group was activated on 15 October 1958 (replacing the 18th FA Gp), allotted to the Regular Army and stationed in Ansbach, Germany. The Group was attached to VII Corps Artillery. On 7 July 1971, the Group moved to Herzo Base in Herzogenaurach, Germany. The 210th Group was reorganized and redesignated as the 210th FA Brigade on 16 September 1980 and was authorized to wear its own shoulder sleeve insignia. The formal ceremony changing the Group to a Brigade was held on 25 Nov 1980 with the VII Corps Commander presenting the new Brigade colors to the Brigade Commander. The 210th FA Bde's motto remained: "Controlling the Best." If you have more information on the history or organization of the 210th FA Group/Brigade (or any of the subordinate units), please contact me . There is an airfield at Katterbach, Germany about 5 Klicks outside Ansbach on the way to Nurnberg, just off the highway. There is an Autobahn now that goes past Ansbach from Nurnburg to Frankfurt that was not there when I was stationed there. I was stationed here in the US Army Artillery from 1962 - 1964. The 210th Group was assigned to 7th Army when I was there, and supported the Armored Units. I had a 7th Army patch. Hindenberg Kaserne 1/75th Arty Bn, Ansbach, which was an old 8in. SP Howitzer Bn This was my first outfit, as a 2nd Lt.
Barton Barracks, Ansbach, had 210th Arty Group Hqs, and 1/33d MSL Bn (Honest John). I had duty assignment as Comm Officer for this Bn. This was my 3d assignment. I was also stationed in Nurnberg, at Merrill Barracks with the 3/39th Gun (280mm) Bn. (2ea Batterys, 4ea Guns). The 39th had one (1) battery (2ea Guns) at Schwabach, Germany, a town about 20 klicks away. I assisted in deactivating this Bn. One of the Guns is in the Ft. Sill museum. The 39th was replaced by the 3/17th Arty Bn with new 8in.SP Howitzers. Most of the troops switched. Some came from the old 75th Bn which was changed in Ansbach. I stayed with the 17th and became the Bn Comm Officer. This was my 2nd assignment. Also stationed at this post was the 2/34th SP 155mm Gun Bn. These were also part of the 210th Group. There was also a Signal Corps detachment at this post and an Armor Regiment Hqs. Soldier's Field was near by, and we trained there. The 1/75th 8in Howitzer was the old SP which had the crew portion housed in a sort of turret. My first assignment. 1962. Hindenberg Kaserne in Ansbach, Ger. This was probably replaced with 175mm Gun Bn as stated in related links. Second assignment was in Nurnberg at Merrill Bks (SS Kesern) 3/39th Gun Bn 280mm. This was deactivated and replaced with the new 8in SP M110. 3/17th FA BN using M110. Third assignment was 1/33 Missile Bn Honest John which had replaced the Lacross 4/28. BTW, the Honest John was eventually replaced with the Lance Missile BN, but I was gone by then. We knew this was coming, and I remember that we were given extra HJs special that emulated the Lance, and we had to send our firing data back to Redstone. I believe we also had the first FADAC computer. FADAC meant Field Arty Deflection Azmuth Computer. Before the FADAC, we used slide rule sticks for computations in fire control. There was a Corporal Missile Bn at Bleidorn also and belonged under 210th. This was eventually replaced by the Sergeant Missile Bn. Do you have any information on Barton Barracks, Ansbach, Germany? Barton Barracks was not far from Bleidorn Kaserne. I was stationed there from 1962 to 1965 with the 1st Missile Bn., 33rd Arty (Honest John). Also stationed there was the 4th Bn., 57th Arty (Hawk) as well as the Headquaters and Headquaters Co. of the 210th Arty Group. The 1st Missile Batallion, 33rd Arty was not deactivated, but it must had moved to the nearby Barton Barracks. I served in the 1/33 from 1962 to 1965. By that time the old rocket launchers had been replaced with a newer model. I was a launcher driver with A Battery, 1/33. The 2nd Bn, 28 Arty did have the 175 guns. It used to be the 1st Bn, 75th Arty, stationed at Hindenburg Kaserne, in Ansbach, then it 1964 it became the 2nd Bn, 28 Arty, and it was still at Hindenburg Kaserne when I left in 1965. I had friends in that outfit, and remember clearly when the change was made. The 175 was real long, unlike their previous weapon, which was the 155. It seems that after I left they moved from Hindenburg Kaserne to Bleidorn Kaserne. It was 40 years ago (1967) this week that I made my way to HHB, 210th FA Gp, Bleidorn Kaserne, Ansbach. I remained until early 1969. Much was the same as described in the email from Dan Whitford (1963 - 1966). I too was assigned from the 34th Sig Bn in Stuttgart, but went directly to the 210th FA Group and began work as a shift-worker. I never saw, nor heard from, the 34th. I was absorbed by HQ at the 210th. Three soldiers manned each shift at the comm center 24/7 by working 12 hours on, then 24 hours off. One each for switchboard, CW, and crypto. No extra workers. In 1967 - 1969 we had a mess section that traveled with us, but we only had C-Rats, but then they were heated in immersion heated garbage cans. The attached photo shows the interior of the two-room comm center. If you look close the 1/33 and 2/28 had lines in to the switchboard. The CW table was along the opposite wall, the TT room was adjacent. This was a locked-down area being very, very high tech at the time. This was, of course, "Jersey", the designation for 210th telephone traffic. In the picture is "Jersey 28" (peacetime radio call "Kind Tribes 28"). Does anyone, besides me, remember the wartime call sign designation? I arrived as an E-2, at age 17. I was an OCS candidate so I wound up at Ansbach until I turned 18. By then attrition, and the turmoil to the East, won a few field commissions under the command of Col. Hockaday (the Hawk). I swear he was everywhere, knew everything, and no one got away with anything. It was a great place and time to serve. I returned to Seattle and started a career as a private detective. Still investigating and handling an explosives detection canine, also. Thanks for making this web site available. Land lines were used for all daily traffic within, and out of, 210th FA Gp. 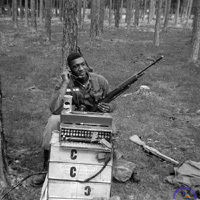 CW (HF), was used for USAREUR traffic, but was seldom used aside from routine radio checks. It was kept operational in case the cryptography section(s) went down. CW was, however, the first notification of all USAREUR alerts probably because of speed. The Crypto was used for all sensitive traffic. Most, if not all, crypto messages were for Col. Hockaday. The J-4, 5, 6 (Q) were for the subordinate officers quarters (J-6Q = S6 quarters = Col. Hockaday's quarters), the S5 unit, and S4 (supply) unit. All these connections were field phones. 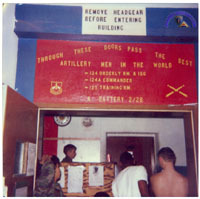 Other sections were the supply room, wire bay, front gate, motor pool, rod & gun club, etc. These also were all field phones. When S6 (Col. Hockaday) was in his office he had an outside line. After hours (and for most other sections) only the switchboard had an outside line. The air raid/attack siren was could be triggered from Col. Hockaday's office or the comm room where the switchboard, CW, and crypto room was. Being locked in with no unauthorized visitors allowed inside we also had white phosphorus to destroy all comm equipment, if needed. So, the phone/call sign designations held close to the actual command level subordinate designations. 6- CO, 5 - Exec. officer, 4- supply, 3- Operations, 2- intelligence, 1- personnel. The 1/33 and 2/28 also needed access to the switchboard in order to get an outside line. I served two tours in Germany. The first was with the 210th Field Artillery Group in Ansbach and Herzo Base. My second tour was in Stuttgart with the 385th Military Police Battalion and then in Heilbronn as Community Provost Marshall. I was assigned to the 210th GP in July 1970. My initial assignment was as Asst. S3 and a few months later I took command of HHB 210th GP at Barton Barracks in Ansbach. Col. Kilpack was GP and Community Commander. 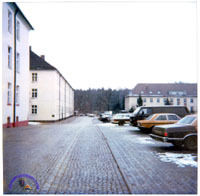 Barton Barracks and Bleidorn and Hindenburg Kasernes were the main Ansbach locations. Katterbach was a small airfield where 210th Aviation Section was stationed. The commissary, PX, NCO Club and Community Headquarters were located at Hindenburg. HHB 210th GP, the 1/33rd Arty and the elementary school were located at Barton Barracks. Family housing, Officers Club and 2/28th Arty were located in Bleidorn Kaserne. In 1971 we re-stationed to Herzo Base. The 1/33rd Arty, 3/37th Arty and a Target Acquisition Battery (I don't remember the number but I think is was A/ 27th Arty) were also moved to Herzo. The 3/37th had been stationed in Dachau but politicians didn't want any US troops stationed in Dachau during the 1972 Olympics so they were moved to Herzo. As an aside, the German Government was so sensitive about their image they took down all the US Army traffic signs in Munich, so Olympics visitors would not think Germany was occupied by the US Army. The signs were never re-installed and that created real problems for soldiers and units moving through Munich. Herzo Base was an old German Airfield and very pretty place with lots of trees and had a PX, Medical Dispensary (with a full time German doctor and nurses plus Army Surgeon) a Golf Course, a Bowling Alley, and Sportsman's Club. The Officer's Club, NCO Club and EM Club were all funded by money generated by base activities like the Audio Club that sold electronic gear. It was a lot like a small college campus. Officer housing was located on base and a large family housing complex was located just outside the base. The only thing we didn't have was a commissary or larger PX. We relied on Nurnberg (Furth) for that. The main Adidas and Puma factories were located in Herzogenaurach. They were owned by two brothers. They had outlet stores where many soldiers got their first athletic shoes and clothing. During my time we had three Group Commanders: Col Paul Kilpack, Col. William Knapp and Col. Al Cade. I really enjoyed my time at Herzo Base and I have many great memories of my time in Germany. I left Herzo Base in July 1973. Aviation Section: We only had 1 fixed-wing aircraft (I believe it was an OTTER). We also had 3 helicopters. I think one was an H13 and the others were OH58. Group Organization: Besides the units mentioned above, the 210th GP also had the 2/17 Arty in Nurenberg. I think they were at Merrell Barracks but I'm not sure of the name. I remember it was near where Hitler held big events and one building had a spot on the top front where a swastica/eagle emblem had been blown off and there were bullet holes in the building. I found your webpage on the 210th FA Bde. It brought back a lot of memories. I was assigned to the 210th FA Group as a single 2LT signal officer from 1977 to 1980. My first day in Germany I hitched a ride from Nuremberg to the post. It was late August and driving up the road from Herzogenaurach to Herzo Base the sun lit up the field and the walls of the post. It was very pretty. Of course I got stuck in a ratty BOQ room above the Officer Club that night which did not make for a good first impression. The next month the unit left for REFORGER which was held in southern Bavaria that year. I impressed the Group Cdr by fixing his field telephone one night and at the end of the exercise he gave me a ride back to base in his helicopter. In August 1978 I got transferred to the 3-17th FA Bn in Nuremberg. Herzo Base had won the award for best mess hall in USAREUR for several years in a row, and the food at Merrell Barracks was pretty bad in comparison. The commo platoon leader I replaced was pretty bad too. He was from Puerto Rico and couldn’t speak English very well. He also whined a lot about the cold weather in winter, especially when we were in the field. This set a very bad example for the troops. I soon got promoted and made the CE Staff Officer. Yet another 2LT showed up to take the job of commo platoon leader. He was even worse than the Puerto Rican. There was a big drug problem in the 3-17th back then, and just before we went to Graf the entire commo platoon got busted for testing positive on a urinalysis test. Also one day at Graf we had to get up very early for a road march. The new platoon leader didn’t like this one bit and he said in front of everyone “If they expect us to get up this early, they should issue us some speed.” Needless to say everyone was shocked at this comment, given the drug problem prevalent in the unit at that time. He got relieved a few months later after being given several chances to improve. In May 1979 I was scheduled to take two weeks leave. I had a plane ticket back to the States. Early on the morning of my flight to the Sstates, our unit got a surprise IG inspection. Since I had my signed leave form, I headed for the airport. This really pissed off the battalion commander and when I got back from leave I found out I was being transferred back to the 210th HHB and made the motor officer. I spent the summer hanging out in the motor pool and basically learning all about vehicle maintenance. In August though, I went camping with some friends in Italy. This was the same month the 3-17th was back at Graf. The irony was not lost on me. In November I got transferred to the 2-377th FA Bn. This was a Lance Missile unit. The new Group Cdr picked me for this job because I had done a good job in the motor pool and because I was the most experienced signal lieutenant. The 2-377th was heaven. Instead of Graf the unit went to Crete to train. Warm and sunny with half naked women on the beaches. It occurred to me that if I hadn’t skipped out on the IG inspection the previous May, I’d still be making periodic trips to Graf with the 3-17th. I spent my last 10 months on active duty in the Lance Battalion and it was my best assignment by far. Later I joined the reserves and then the National Guard where I went on to spend the next 25 years. But I’ll always have fond memories of the 210th Field Artillery Group. The commo mission in 210th FA Group was basically to talk to VII Corps HQS and VII Corps Artillery HQS. We would sometimes have to talk to 1st Armored Div HQS, too, if our mission was direct support of 1AD. At the group level we were supposed to get a multi-channel van from 34th Signal Bn. The MC operators were not very well trained back then and the multi-channel seldom worked. Instead, FM radio was the standard means of commo. We also had RTT rigs and landland teletype. However, the landline teletype ran through the multi-channel rig, so if the multi-channel didn't show up or broke down, then the landline teletype was useless. The RTT rigs were also pretty useless. They produced reams of paper containing information that was several hours or even days old. So all the artillery officers cared about was FM radio. At the battalion level there was no multichannel. There was just FM radio and RTT rigs. Technicallly we had AM voice radio, too. However, the AM radio was so big that it filled the back of a jeep. Most commanders had it removed to give them more space for personal gear or to provide a seat for the Sergeant Major. The key to success as a commo officer back then was making friends with other commo officers so that you could borrow lots of spare radios when you went to the field. This way if one broke, you could swap it out. Trying to get a radio repaired back then was a very lengthy process. The radio would be gone for days if you took it to a maintenance battalion. I often wondered what would happen if there was a war and we all needed our radios at the same time. Fortunately that never happened. I should also add that when the commo platoon in 3-17th got busted it wasn't just for testing positive, it was for selling drugs too. I should have been suspicious when a SP4 in the commo platoon bought a late model Mercedes. Where did he get the money for that? However, others were suspicious so the platoon got raided and they all got caught. I just looked up my old unit on Google for fun and really enjoyed the info supplied. I especially enjoyed and identified with Mike Tando, 1st Msl, 33rd Arty. I was stationed at Bleidorn Kaserne in Ansbach, Germany 1982-1984. We had M109 SP 155mm Howitzers. Our unit spent many 30-day training stints at "Graf" as well as several local deployments a month. And of course " FULL ALERTS." Barton Barracks, Hindenburg Kaserne and Katterbach (the airfield) were all in place and operational during my deployment. Hindenburg was the main local hub with the PX, Bank and Movies. Barton Barracks had Movies as well. Katterbach which was too far to walk, had all those things, plus a newly constructed "Burger King" which I thought was amazing but rarely visited because of all the great local food and of course the German bier. "Ludwigs Stube" was probably the most visited German restaurant and they even had a "Pizza Guy" deliver to the barracks. I ultimately served as a driver for 1st SGT Kiernan, and Colonel Michaud as well as Captain Dunham and several other officers assigned to me. I truly enjoyed the privilege and responsibility they gave me. Especially 1st Sgt, he was a character. I was referred to on occasion by my direct superiors as "little general" because I liked to smoke cigars with them and help man the radio and maps in the field. I thought that was pretty cool. I was also "OJT'd" (on the job trained) as a PLL (Prescribed Load List) clerk to replace an outgoing clerk and because they couldn't get a new one right away. I was assigned to the Motor Pool when not in the field. I was also ordered to be the "R&U" "Repair and Utilities" man which entailed making general facility repairs. Funny, I had lots of duties. From driver, clerk and handy man. I never was assigned to a gun as a 13 Bravo which was my MOS. I met a beautiful German girl while stationed in Germany and continued a long relationship with her. I ended up studying German as my minor in college and even transferred one year to the University of Maryland in Munich so we could be close. I headed to Seattle after graduating college in New Hampshire. One interesting thing I do remember is that, as GI's, we needed "Membership Cards" to go to many local nightclubs. The bars only let so many American GI's in at a time and the cards were hard to come by. The cards would be sold at a premium by GI's who were rotating back to the states. Or should I say, Short timers rotating back to the world. Those Army years in Germany and traveling Europe are full of great memories. I'm sure my experience was much different than those who served 40 years earlier. I was stationed at Herzo Base during it's last 10 years as a US Army installation, from April 1982 to February 1992. Yes, I was there that long! I started out with the 3/37th FA (spent 4 years with that 8-inch/203mm cannon artillery battalion), then moved next door to the 2/377th FA (a Lance missile battalion) for 2 years, spending my last 4 years with the HQ 210th FA Bde. I managed to stay at Herzo Base as long as I did because (a) I kept changing jobs (I worked at both battalions and then at brigade) and (b) they kept promoting me (I arrived there as a very "green" Staff Sergeant and left there as a newly-promoted Master Sergeant). I would have stayed longer (I had been accepted for a First Sergeant's position with the 55th Personnel Service Company on W.O. Darby Kaserne in Fuerth), but they decided to shut down VII Corps, which included everything in the Nuernberg-Fuerth-Erlangen-Herzogenaurach area! I saw the end of the REFORGER exercises (we participated in several of them -- 3/37th FA and it's M109 self-propelled howitzers), went to Crete for live-fire exercises (and watched as 2/377th FA (Lance) became 2/12th FA (MLRS)), and went to Saudi Arabia in December 1990 when the 210th FA Bde deployed in support of Operations DESERT SHIELD and DESERT STORM. We got back in April 1991 and immediately started drawing down (the announcement had already been made the year before, just prior to Iraq's invasion of Kuwait in August 1990). When I left Herzo Base, both battalions were gone and there were only about five of us left "minding the store" up at brigade headquarters. I'm still in touch with several folks from those days: Richard Leap (then a CPT, now a LTC in Fort Carson CO), Tom Edmundson (my last CSM with the 210th, now retired and living in Copperas Cove, TX), Edwin Vernon (former Brigade Commander, now living in Pinehurst, SC), Sam Floca (former 3/37th FA commander, now living in Texas), Doug Langdon (retired 1SG from Btry A, 2/377th FA), Ray Hanning (retired MSG who ran the HHB 210th FA Bde motor stables), etc. I last visited the base about 2 years ago, observing how Weinquelle Brackhoff (from Erlangen), Adidas, and a local furniture store took over most of the motor pool and the larger storage buildings (e.g., the old commissary and PX); they set up a Montessori school in the old education center as well! Most of the barracks have fallen into disrepair, although I noticed that, of those that survived, they were being used as music studios/practice spaces and other things, mostly on the initiative of the local youth groups. They say you can never go back, right? Just ran across your webpage, I AM IMPRESSED, very good layout and information. I served at HERZO BASE from April 1984 - November 1985 with HHB 3/37th FA. At the time I arrived, the Post Commander was COL.Charles B. Hood. The 3/37th BN CDR was LTC Samuel W. Floca, and the BN SGM was SMG Ernest Dameron. HHB 3/37th's CO was CPT Richard B. Leap, but I can't remember the 1SG's name at the moment. Don't know what kind of additional info you are looking for, but I understand that the base was given back to the Germans in 1992, and now most of the ADIDAS company owns and has also demolished / built up the post for their use. 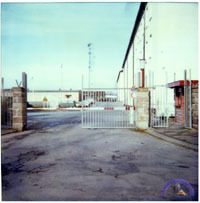 Also, this past March 2005, the MAIN GATE was TORN DOWN along with the NCO CLUB. I have lots of pictures from the MID 1980's of the Post and the surrounding areas of Furth, Nuremburg, etc., as this was MY FIRST overseas assignment and it has always been very special to me. I was there in the 28th Arty from 1966 to 1969. Was also at the airfield in Katterbach. Was in the 35th for a short time. 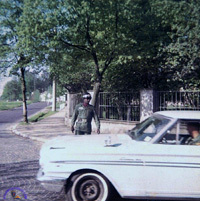 Barton Barracks was home for me from January 1963 through May 1965. First arriving at Merrill Barracks, Nurnberg, assigned to the 3rd of the 39th FA, Aviation Section, I was transferred to Ansbach. If my memory is correct, the 3/39th FA, 2/34th, and 1/75 aviation units were all assigned temporary duty to Hqs Btry, 210th FA Group at Ansbach. Temporary duty but for an indefinite period of time. These Aviation Sections and that of the 210th all worked together at the airfield at Katterbach. This was a great time for me. After about a year working on the L-19 Birddogs I transferred to Hqs Btry, 210th, and took care of the U-6 Beaver. The airfield at Katterbach was a nice place to be. I miss all the guys and the pilots and remain in contact with three of the men, Jim Ashcraft, Wendel Borgerson and Larry Nix. I believe one of our pilots, Steve Snyder, was the pilot lost on Flight 800. I also heard fascinating stories about the stuff supposedly underground at Merrill and Barton Barracks. What else? Basic at Ft. Ord, school at Ft. Rucker. Shipped over on the Geiger and back on the Rose. Was a Spec 4. Also had friends among the aviation mechs at Illeshiem. Drew flight pay and proficiency pay, which made quite a difference to my paycheck. Sure would like to hear from Bruce Kutz, Steven Lowe, Pharies Petty, Tom Lindsay, Tom Perkins, any of the pilots and mechs who were a part of our group. After boot camp and aircraft maintenance training I arrived in Nurnberg in January, 1963, assigned to the aviation section of the 3/39 FA, Merrill Barracks. I remember the 280mm atomic cannons there, the snow and how cold it was. I turned 18 a month later. 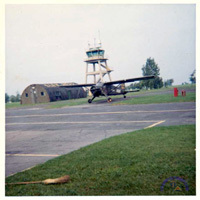 The Aviation Section was stationed at Barton Barracks, Ansbach, and worked at the airfield at Katterbach. After a few days I was shipped to Ansbach. The (aviation sections of the) 3/39, 2/28 and I believe the 2/34 FA aviation units were consolidated under the 210th FA Group, Hqs Battery. Barton Barracks was technically a temporary location for the units, because each was away from its home outfit. 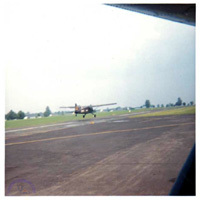 Each unit had two O-1A Bird dogs, or L-19s. The 210th had a U-6A Beaver and an OH-13 Sioux (Bell) helicopter. I had a great time there. I transferred (on paper) from the 3/39 to the 210th and, as a Spec 4, drew flight pay and proficiency pay and flew many hours as a passenger in the aircraft. We had some very good officers/pilots and men. One sunny day, possibly in 1964, many of us watched a Lufthansa 720B explode a few thousand feet over Katterbach. We later found out only the crew was onboard, but never found out why it blew apart. The images remain in my mind. I have some photos, not very good ones, of that time of my life. I would like to find good photos of Merrill Barracks, Soldier's Field, Barton Barracks and Katterbach as it was then. My three year enlistment was near to ending and I rotated home in June, 1965. I was at Merrell with the 3/17 from July 1970 to April 1972. I was FDO and XO for C Battery. By the way, I am looking for interior pics of Merrell. Especially the post chapel etc. I was the Fire Direction Officer and Executive Officer for C Battery, 3/17th FA from 1970 to 1972. 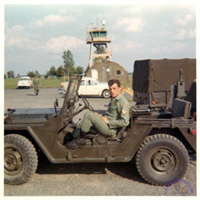 I arrived in Germany in July 1970 and I was originally assigned to the 6th Battalion, 10th Field Artillery at Bamberg. I was reassigned immediately to the 3/17th in Nurnberg because they were reorganizing the unit and needed officers. I wanted to start looking for an apartment right away so I could send for my wife, but I stayed in Bamberg a few days and was then sent to Grafenwohr for a month on maneuvers. My hold baggage had already been shipped to Bamberg, so I had to have everything sent to Nurnberg after it arrived. I managed a ride from Grafenwohr down to Nurnberg on a supply truck, and I first saw Merrell in mid August 1970. It was a huge imposing structure that looked like not much had been done to it since the war. Merrell Barracks had lots of stories about what had happened there during and before the war. They had to do with all sorts of ties to the Nazi parade grounds in Nurnberg and the fact that is was a local headquarters for the “SS”. It was a huge building with many floors and rooms. It was designed to house over a thousand men. It had four stories and an attic above ground, and three basements below ground. Only one of the basements was open to be used, the others were flooded after the war because of fears it had been boobie trapped. The whole complex covered about 4 square city blocks. The basement was very dark and scary. I used to carry a load 45 when I had staff duty officer at night and had to check on all the equipment storage rooms. I saw rats down there as big as cats. My office had bullet pock marks in the interior walls. It overlooked the main gate from second floor. The front of the building was still shell marked from the bombing and fighting that took place there in April 1945. My tour was during the Viet Nam war era, and it was common for drug searches to be conducted in the barracks. I had to keep watch from the quadrangle below and notice which windows things came out flying out of. The troops would throw things out the windows to keep from getting caught. My routine was to spend a month in Grafenwohr, or Vilseck, training with the unit, then back to Nurnberg for a month of maintenance and inspections. We were a nuclear capable unit and had many inspections by USAREUR, DOA, and the NERC. Officers would also go back to Grafenwohr to serve as live fire safety officers for other units in training. 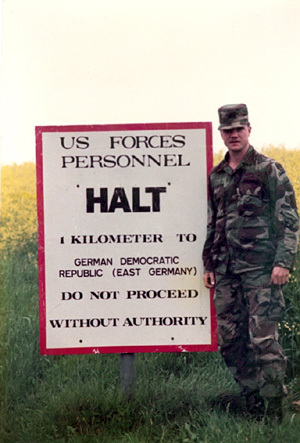 I spent about 8-1/2 months of my tour of duty in Germany in the field, in training away from home, or acting as umpires for US based unit maneuvers, such as REFORGER. My wife came over in October 1970. I could not get quarters for 83 weeks, so we lived off post in a second story apartment rented from a German family. We became very close to them and stayed in touch over the years. I even had an opportunity to visit a few days with them while on a business trip back to the area in 1978. My wife and I traveled as much as we could during our time in Germany. We visited 11 countries and had a wonderful experience. My wife was able to visit East Berlin and pass through the Berlin wall at “Check Point Charley”. All of the Americans who lived in Nurnberg were a close group, and we enjoyed the social opportunities a great deal. We forged friendships that have lasted to this day. I could write a book on our experiences, and may one day for my children and grand children. I served in the 2nd Bn 28th FA from March 1964 to September 1966. I entered the service in September 1963, finished basic at Fort Ord, California, and received advanced training at Fort Sill, OK, where I received an MOS in Fire Direction Control. My first assignment was to a Target Acquisition Battalion at Kelly Barracks near Stuttgart. The unit was in the process of disbandment so within a month I was assigned to the 2nd 28th at Hindenburg Kaserne, Ansbach. At that point in time the old 8" guns were in the process of being phased out and being replaced by new 175mm self propelled guns. The battalion insignia motto was "We Support The Line" but after firing top scores at Grafenwohr during the summers of 1964 and 1965, most of the troops liked to use the motto "Best By Test". The Battalion Commander at the time was Lt Col. Robert McKenna, a fine officer who was well respected by all who served under him. Although the Cold War was at a zenith during this period, our unit went through the normal number of drills, alerts, and FTX's without incident. In early 1966, the 2nd 28th was moved from Hindenburg Kaserne up to Bleidorn Kaserne at the top of the hill not far from Barton Barracks. From what I'm told, Bleidorn has been turned back over to the Germans and is now used as a police training facility. Upon our departure from Hindenburg, an Armored unit moved into the Kaserne, I believe from the 4th Armored Division. I understand that after the Americans vacated Hindenburg much of the post was razed to make room for a large shopping center. Although I support progress, I must admit that I was a little sad at hearing this news since I had made so many friends, and had so many memories, from that post. fuel depositories from the war. The open field at Katterbach was a popular area for our battalion picnics and other events. There was also a Bundeswehr Kaserne across the highway from the airfield but I don't recall its name. There was a U.S. Air Force metro unit stationed at Katterbach who would come to Hindenburg Kaserne daily to pick up their mail at APO 09177. I remember the Soldiers Lake quite well as I would go out there during the summer months and fish for trout. At the time, the only military presence near the lake was a Hawk missile facility at the top of the hill above the lake. I assume this is the general area where the present Shipton Kaserne is located. My memories of Urlas are not so fond. During that time, Urlas was essentially a munitions depot and ready reserve of vehicles for use if war came. All the battalions in Ansbach took their turn at "Urlas Guard", which had to be just about the worst guard duty one could pull. Four on, eight off, for three full days. It gave the word "boring" a whole new meaning! During my stay in Ansbach I made many German friends, two of which I still have contact with 40 years later. I also very taken by the German culture, music, and their zest for life. After returning from the service I rejoined Pacific Gas and Electric Company in San Francisco and retired as a Warehouse Superintendent after 37 years of service. I now live in the Sierra foothills with my wonderful wife, Donna. In closing, I would very much like to know whatever became of the 2nd Bn 28th FA. Was it moved somewhere else in Germany or disbanded? I was at Bleidorn Kasserne from April 1967 till November 1969. I was in the 2nd Battalion, 28th Field Artillery, B Battery. I arrived there as a Private E-1 and left as a Staff Sergeant E-6 - all on the same 175mm Gun. The 175mm Gun had a 39 foot tube and I had never even seen one in AIT. What a shock. In 1968, early one cold morning, all the sergeants were taken away (Vietnam) and dawn broke with an E-6 Acting Sergeant Major, E-5 First Sergeant and all E-4 Gun Chiefs. The Battery Commander was a 2LT. Next day, off to Graf for annual Gunnery. Would like to talk to anyone who was there. I joined the Army July 1983, a few days after my 17th birthday. I reported to Ft Sill, Oklahoma for cannon crewman training (13B MOS). I graduated in October and was sent to Germany. I reported to the 21st Replacement Detachment in Frankfurt (Rhein-Main Air Base) from there I received orders for the 2nd Battalion, 28th Field Artillery in Ansbach. The 2nd Bn 28th FA was under the 210th Field Artillery Brigade in Herzo Base. I arrived and in processed to the unit. The base was called Bleidorn Kaserne. It was on top of a hill overlooking the city of Ansbach. On the other side of the hill was Barton Barracks which housed the 141st Signal Battalion. The 57th Air Defense Artillery was stationed there also. They manned the Hawk missile sites outside Ansbach on the way to Katterbach. In Katterbach were the Non-commissioned Officers Academy, an aviation unit, and a few other units I am not sure about. 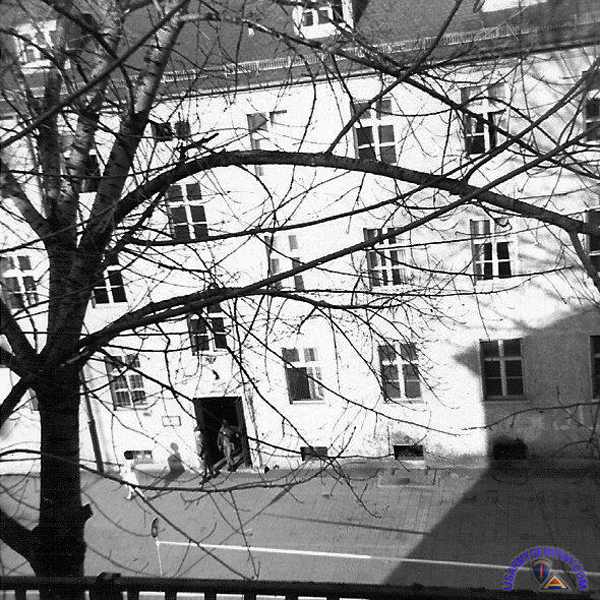 In the city of Ansbach were the 1st Armored Division headquarters and other units including our finance unit. The 2nd Bn. 28th FA was using M109A2 self propelled howitzers with M548 (tracked vehicles) as ammo carriers. 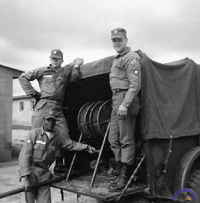 The unit consisted of Alpha, Bravo, and Charlie batteries (6 guns each); Service Battery (had M88 track recovery vehicles, 5-ton trucks for ammo) and Headquarters Battery. 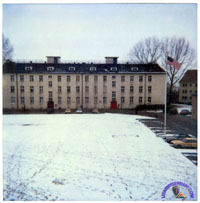 We lived in 3-story old German Army barracks surrounding a parade field. There was also a gym/medical clinic building and a mess hall building. On the base was also the 501st Military Police Company. The 2nd Bn. 28th F.A. spent a lot of time in the field. We used to rotate to Grafenwöhr for live fire at the ranges. We went to the borders of East Germany, West Germany and Checheslovakia and had maneuvers with the 2nd Bn., 2nd Armored Cavalry Regiment. We guarded a place called NATO Site 23. It was where nuclear warheads were kept. The unit participated in CAPSTONE exercises and many drills to simulate an invasion of West Germany by the Russians and communist countries. I was stationed with the 2 Bn. 28th F.A. from Oct. 1983- April 1985. I was then ordered to Fort Benning Georgia. I performed the duties as unit armorer and all cannon crewman positions while assigned to the unit. Being away from home, I made some very close friends with the soldiers in the unit. I am proud of my service and proud of the soldiers I have met and worked with. I was in the 33rd from May 1960 to Dec 1962. Spent most of my time in special weapons (nuclear) during that time. We set the record for the closest round to target and also pulled the fastest mission in history of Honest John missiles. A Battery and HQ Battery were located at Barton Barracks, Ansbach, during the time I was there. I visited it again in 1990 and it now contains mostly communication units. At one time Ansbach was known as "Atomic City" because almost every unit in town had nuclear capability. If you would like more info,contact me. I also have a friend I was stationed with close by and we talk about the 33rd days all the time. I read with interest the "history" of the 1st Missile Battalion, 33rd Arty, but found that the author "understood" that the unit was disbanded in 1958. This is not correct. Sometime before my arrival, the 210th Arty Group Command and the 1/33rd Arty moved to another Kaserne on the outskirts of Ansbach. The new location was Barton Barracks, about three miles out of town and perched on a plateau that overlooked the valley (and Ansbach). The Kaserne had been a WWII German Signal Unit with a huge ballbearing factory completely underground and directly beneath the Parade Ground at the center of the Kaserne. I arrived at my new home for 32 months on a snowy night exactly one year before President John Kennedy was assassinated (11-22-62). I had gone through Basic at Fort Ord, California.....then on to Fort Sam Houston in San Antonio, Texas for Med Corpsman, Med Specialist, and Surgical Tech training. Our whole unit was to have gone to Fort Benning for Jump Training after graduation.......but that was not to be. The "Missiles of October" was upon us and everything came to a screeching halt. Full Alert for weeks. Finally, everyone's orders were changed, with me being assigned to the 1/33rd Arty for the duration of my active duty. The only good thing that came out of the Cuban Missile Crisis was that no shipping was allowed in the Atlantic while Castro's Nukes were shipped back to Russia......so I got to fly from New Jersey to Rhein Main AB in Germany. A ten-hour flight instead of a 5-7 day troop ship crossing in the North Atlantic in winter. I was assigned to the Battalion's Dispensary and soon learned that we were a full field unit. I spent my first Christmas in Germany in the field as we "guarded" the Czech Border. I'm not sure how it happened but I soon became the Battalion Commander's Driver and was assigned to S-1 in Headquarters Battery. During my tenure I drove for two different Battalion Commanders (light Colonels)...Col. Berthelson (sp) and Col. Mattix (sp). Both were good men. When one of them found out that my dad was a retired Army Sgt Major (WWII Pacific Theater) and that my Uncle was a recently retired full Colonel, they encouraged me to apply for OCS. I had scored well on the OCTest but was advised by both my dad & uncle not to apply to OCS until I finished school with a decent MOS. Well, the only thing left to do was do the physical and the Oral Board which was held in Nuremberg. I passed all of this and was awaiting the next OCS at Fort Sill, OK when the Army changed the deal. At the time I applied you were only required to complete six months of active duty, then go into the active reserves after you were commissioned. They changed the deal because things were starting to look like we would be getting involved in Vietnam. When I was told that I would be required to spend a minimum of 30 more months after being commissioned I sought advise from my family. I pulled my application to OCS and remained in Ansbach (same assignment) until rotating in June 1965. It was funny........only the C.O. and X.O knew I had applied to OCS. After I backed out, and whenever we were in private, both would refer to me as "Sir" and neither ever looked down on me for choosing to remain an E.M. Looking back, my assignment in southern Germany was a great experience. I was able to travel all over Europe and the Germans still liked us at that time. There were almost four marks to the dollar so our money went far. I found a great girlfriend who I hated to leave. I do think often about some of the guys I was stationed with who went to Vietnam early as "advisors" and didn't make it home. After getting out.........back to Seattle, work, and the University of Washington, eventually finishing at the University of Puget Sound on the G.I. Bill. I am now a retired Seattle Police Homicide Detective (30 years) and teach Martial Arts to keep my 60 year old body half-way fit. I am married to Karen who is a CSI. We met at a homicide scene 27 years ago when she was a brand new fingerprint expert and I was a young Homicide Det. Love at first sight. We were married 25 years ago and she raised my two young sons from my previous short-lived marriage. After college, both sons ended up in southern California........which is a great excuse for me to jump on my BMW Motorcycle and visit. The 1/33 had four batteries. Each Battery had one Honest John Rocket launcher I believe. H.E. warheads were always attached. The nukes were "close by". Each Battery could have had more 10T launchers but when we hit the field on an alert, only four went out as far as I can remember. Of course, during training & firing at Graf, only flash-smoke warheads were used. Up until the two "accidents" in 1961 (before I arrived) they had trained with H.E. I think those two incidents are still classified. The other missile unit on our Kaserne was a HAWK Unit (homing all the way killer). They could not train/fire those in Europe, but would have to return to the States twice a year. We were all part of the 210th Artillery Group . . . which also included traditional 105's, 155's, etc. It is my understanding that when the 1/33rd went to Vietnam, the men reverted back to cannon cockers, and went as advisors. I read with interest the "history" of the 1st Missile Battalion, 33rd Arty, but found that the author "understood" that the unit was disbanded in 1958. This is not correct. (I also confirmed this) Sometime before my arrival, the 210th Arty Group Command and the 1/33rd Arty moved to another Kaserne on the outskirts of Ansbach. The new location was Barton Barracks, about three miles out of town and perched on a plateau that overlooked the valley (and Ansbach). The Kaserne had been a WWII German Signal Unit with a huge ballbearing factory completely underground and directly beneath the Parade Ground at the center of the Kaserne. I was stationed at Bleidorn Kaserne in Ansbach, Germany, 1965 thru 1967. My MOS 36k20, wireman, and I was assigned to the 1/33rd. Most of our time back then (8 months out of the year) was spent in the field. I hope these pictures will be a help. We set-up wiring and switchboards for all batteries (HQ, A, B and C). We are the first out to the field and the last to return. Garrison responsibilities were all details needed to be done on post. 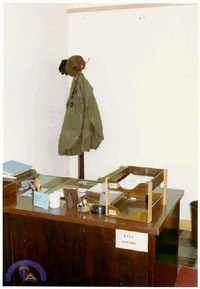 The switchboard was located in 210th HQ Building. We also had a VHF team with us. Can't remember their unit number but they would go to Verona, Italy, once a year for training. Was not the 1st Bn/36th Arty a unit of the 210th Group out of Ansbach? 1/36 was an 8" SP unit nuclear. I’m sure I’m right and I know I was in 1/36 because I still have my weapon’s card and other stuff. The 2/28 also sounds familiar as I think I had a friend from Orlando as an officer in the same position as I.
I was first assigned as Executive Officer of B Btry (and every other assignment because there were only two officers per battery) in May 1967. 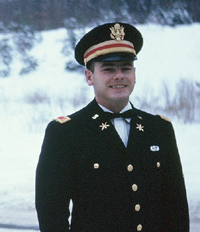 In 1968 - 69 I was A Btry Commanding Officer as a 1LT. A battery was the first I knew of that scored 100% in the three week long live firing tests at Graffenweir. 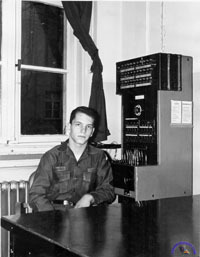 1/36 was in Ulm when I joined the unit and later moved to Augsburg where it was when I took an European out and ended my military service. Later I worked as a civilian on Pershing 1A back in Ulm and stayed there until Dec 1973. I would like to know more about 210th. Could you put out a request for persons (at that time all males) for anyone in 1/36 batteries? I am proud of my service. Never stayed in touch, cause that was not manly or whatever. I love the military. My Son, Daughter-in-law, Dad, all my three brothers, all my uncles and grandfather in England (he had all girls) served for their country. I have worked in the defense industry for the past 25 years. And pray every day for the troops everywhere. God bless them. I came to C Btry, 1st Bn, 36th Arty in May of 1967. It was at Wiley Barracks in Neu Ulm. I believe the battalion moved there in 1965 or early 1966 from Crailsheim. We moved to Augsburg in June or July of 1968, Panzer Kaserne, I beleive. 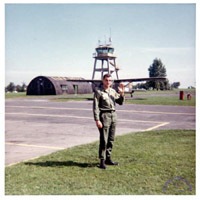 I rotated back home in Nov. 1968 while the rest of unit was in Graf. 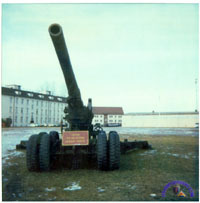 1st Battalion, 36th Artillery was located at Wiley Barracks, Neu Ulm, in 1967, moving there from Erlangen in approximately 1966. 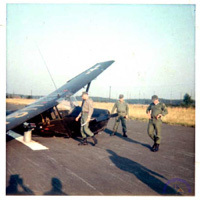 It moved to Reese Kaserne, Augsburg, in August 1968. It was part of the 210th Artillery Group, headquartered in Ansbach, commanded by Col. Spencer Hockaday, aka, "the Hawk". The 5/37th was in Dachau, and the other unit was in Ansbach, don't remember the unit's designation. I was in the 1/36th from July 1967 to April 1969. 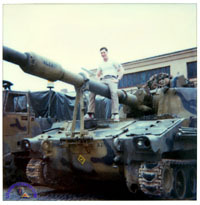 I was a gun bunny in “C” Battery 2/28 Arty (175mm SP) in Augsburg from January 1968 to October 1968. 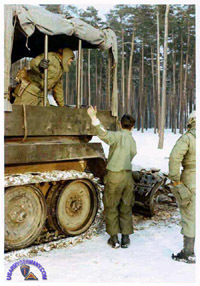 Then I was the track vehicle recovery mechanic in Service Battery 1/36 Arty (8in SP) in Ansbach from late November 1968 to November 1970. When they first put me on that VTR M-88 it didn’t run very well and hadn’t been to the field for a while. Its name then was “Big Sam”. It would sputter and backfire without any power. My father taught me that symptom means the engine is 180° out of time. The magnetos were timed according to the TM Manual. After sleeping on the problem for a night, the next day I pulled the magnetos out and replaced them 180°. I started it up and it ran perfect. After a few months our battalion motor sergeant left and Sgt. Whitlow, “A” Battery’s motor sergeant came to Battalion Maintenance. He told me to paint it and rename it “Sad Sack”. Little did I know that my adventures with “Sad Sack” were about to begin. Out of it all I only have a couple of pictures and lots of memories. The photo I’m attaching was taken in Graf. The battalion was in the field firing the guns. I was on standby waiting for a call on the radio. Two guys from ammo section came over to visit when the battalion commander’s driver came by in his jeep (without the battalion commander) and yelled “Smile”. After we were back to Ansbach he came by and gave me this picture. My dad was with B Battery 867th FA Bn in Heilbronn. After having enlisted in the US Army in 1946 and serving a tour in Panama, I was discharged from the Army in 1949. Soon afterwards, I moved to Fort Collins, Colorado to attend Colorado A & M on the GI Bill. After graduating, I went back on active duty and enrolled in the basic artillery course at Ft. Sill, OK in January 1954, as a Reserve 2nd Lt.
After marriage to my college girl friend (Dan's mother, Janet) and a short honeymoon, I traveled (unaccompanied) to my first assignment with an artillery unit stationed in Dachau, Germany, the concentration camp during the war. It had not change much from that time, but was now filled with Displaced Persons (DPs) from all over Europe. We lived in the same buildings used by the prisoners - and had built a makeshift church out of tin cans. I remember nights on duty in the guard towers that surrounded the camp – and how eerie it felt to be there. We had a small firing range outside the camp that was used to keep qualified, and when the mess personnel would bring out the meals – there were always five or six displaced people standing at the end of the line near the garbage cans. The men of the unit helped however they could, but this was very sad to witness. 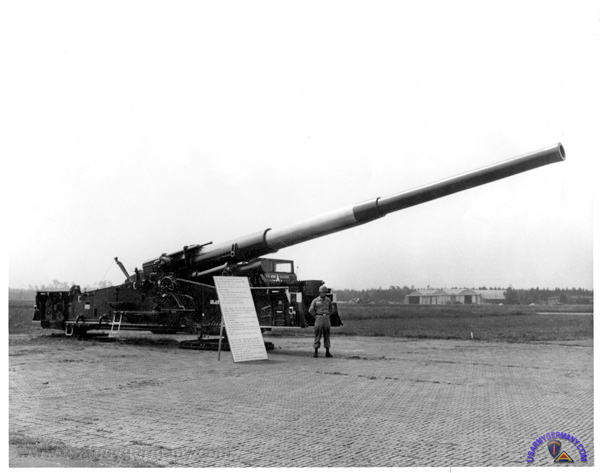 After receiving my Regular Commission, I was transferred to Heilbronn, Germany with a 280mm Field Artillery (Atomic Canon) Battalion. 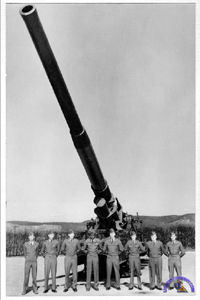 These big heavy guns could shoot an atomic round 20-25 miles - and were mounted on a huge carriage unit that was pushed and pulled at the same time by two trucks at each end. 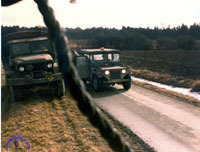 While out on maneuvers, the two drivers would have to communicate with each other constantly to get through the narrow streets and traffic. But sometimes we would cut it too close and take a little corner off buildings. We actually had a special team that went ahead of us to test whether the bridges could handle the weight of the guns. The Russians weren’t allowed to be in our area, but every once in a while we would spot a sedan of Russian military – and we would have to call the MP’s. This was the time when you never knew if and when the Russians were going to attack. I bought a used car after Jan joined me in Germany, and was surprised to be handed a pack of papers when I picked up the license plates. When I opened the envelope I found some maps and instructions for Jan – in case the Russians invaded, she was to take our newborn son and another wife with her - and drive the car to the coast for evacuation. With the amount of atomic weapons targeting that area, most of Germany, including my unit, probably would not have survived if the Russians had attacked - and we'd actually have to use those big guns. Attached are a few good pictures of a 280mm Gun at an off site firing position near Grafenwohr where there was a firing range. I found these with a bunch of old slides just recently, and thought to share it with you. In other articles on your web site, it was indicated that the unit was de-activated. An 8" SP howitzer BN 3/39 moved into Merrell Barracks. I believe the New SP was mounted on the M109 chassis (155mm also used this chassis, I believe). Had a diesel engine. The old M55 chassis used a type of turret, was gasoline powered w/v12 Continental engine, and was scrapped. 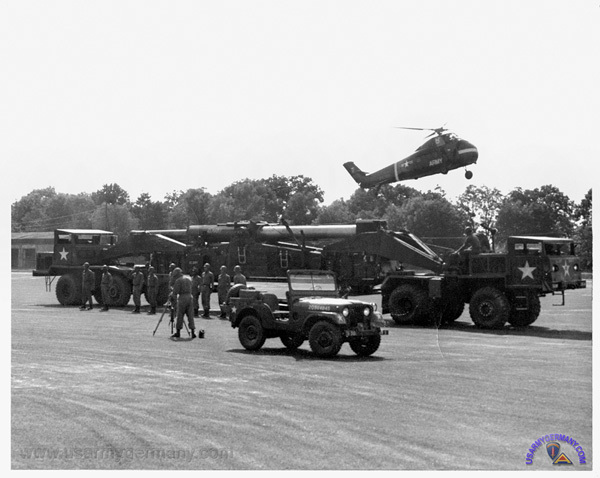 The story posted on the Overview Page, Field Artillery section, relating to the preparations for a NATO demonstration held at Merrell Barracks in 1963 is a TRUE STORY. I was there. 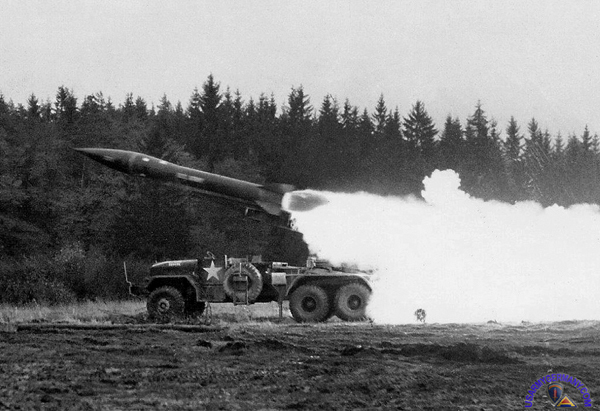 Also, referring to the the STARS & STRIPES article about retiring of "AWOL," the last 280mm gun, also on the Overview Page, does not mention the fact that the Gun had to be moved by its own power and transporters in a convoy from Nürnberg Merrell Bks, via Autobahn to Munich, and then west on the Munich to Frankfort Autobahn to the Mainz Army Depot, near Wiesbaden. One of the transporter units blew a tire on the Nürnburg-Munich Autobahn and the gun tipped over. One of the transporters was damaged and could not operate. An Engineering Unit from Munich and its heavy Cranes lifted the Gun onto the Autobahn median, and we had to guard it a few days until a spare Transporter could get there from the Mainz Depot. I was Duty OIC at the time and had to get the Bn Col. and his helo pilot notified and they flew to the accident site. No one was hurt badly as far as I can remember, but the accident was in all the German papers. I don't know if it made the Stars & Stripes or Army Times tho. Gun = high velocity, flat trajectory, long range, very inaccurate at distance. Examples being naval guns 5'/54,the battleship 16'/50 and the M-107, 175mm gun. Howitzer = medium velocity, medium trajectory, capable of both low and high angle fire, medium range, very accurate. Examples: the M101/M102 105mm, any of the current 155mm and the M-110 8" howitzer. Howitzer = medium velocity, medium trajectory, capable of both low and high angle fire, medium range, very accurate. Examples , the M101/M102 105mm, any of the current 155mm and the M-110 8" howitzer. Another thought. The big 280mm Gun and transporters (T-10) had limits where we could set it up to fire. There were only two or three firing positions at Grafenwohr, which were off the reservation where we could set up. Assigned to 3/39 was a tractor trailer with flatbed, and a Caterpillar D7 track bulldozer, that was used when the gun got stuck in the mud or snow, to tow it up to solid ground. It had a hefty winch and tow cable assembly. The off reservation sites were also used for the Honest John Rocket unit, 1st MSL Bn, 33rd Arty, which was located in Ansbach at Barton Bks, I believe. I spent a short tour with them as Bn. Communications Officer also, before returning back to the States. I ran across the web site featuring stories from veterans who were stationed at various times at Bleidorn Kaserne, Ansbach. I would like to submit my story for the time I was there as well. In December of 1963 I graduated from Commo School at Ft. Gordon , GA and was assigned to the 3rd Bn, 38th Arty, Missile, at Ft. Sill , OK . This was a Sgt Missile unit but at that time its main duty was to provide bodies for all types of details on base i.e. KP for OCS, drive for the Survey School , and set up radio relay on top of Mount Scott when other units were on maneuvers or for convoys enroute and many other Mickey Mouse details. Our sister battalion, 1st BN, 68th Arty, Missile was preparing for deployment to Germany and was in need of a Teletype/Cryptographer, my MOS. I applied for the slot and was accepted and assigned to Headquarters Battery. The battalion sailed from Brooklyn Army Terminal in early September, 1964 aboard the USS Upshur and after nine up and down days on the North Atlantic ; we arrived in Bremerhaven , Ger. then a train ride to our destination, Ansbach, Ger, Bleidorn Kaserne. Waiting for us was the advance party and all our equipment, vehicles, missile components, etc. all requiring unpacking, storing, and setting up the Message Center , Motor Pool and a myriad of other details. We had the requisite monthly alerts and twice a year deployments to Graf for training. As a Sergeant Missile Unit, we could not fire on the mainland of Europe so once a year the Firing Batteries would airlift to the Hebrides Islands, Scotland for actual firing missions out over the ocean. I never made the missions but those that did were not very complimentary towards the British Troops who were stationed there, especially their meals…kidney pie, baked eggs and who knows what else. Here was an instance when C-Rations were appreciated! We also took our rotation pulling guard duty at Urlas, 4 hours on, 8 hours off for three days at a time. I will say it was the only time that I was issued live ammo for guard duty. I recall that right next to the Urlas site was an HAWK Missile unit and when any aircraft got within a certain distance, the missiles would rise up and track the aircraft until it was out of range. Thank goodness they never launched. In December of 1964 I was promoted to Spec 4 and placed in charge of the Message Center and as a Section Chief; I was exempt from KP, guard duty or CQ. 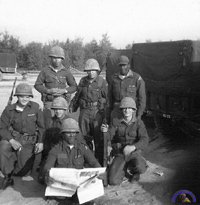 I rotated to the States for discharge in June 1966 and that September the Battalion moved to Schwabisch Hall and with the exception of one person from my time there, I have not had contact with any others. Hopefully I have given some in-sight to my time there. 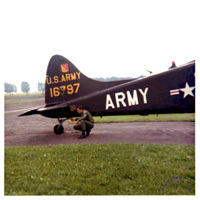 I served in the 1/75 Arty, 210th Group for 1959-61. Presently I am in contact with several other members of that unit from that time frame and we are exchanging stories and photos about our service there. While researching Ansbach and the 210th Group but especially the 1/75 Arty (then having the M55 8" SP Howitzers), I find there is very little contained in the material about us. I just missed the reunion of the 2/28th in Columbia, MD last fall. I would have liked to be there. Often thought of a reunion of the 1/75th alumnae but the best I can do is have a small group of us exchanging war stories and pics on the internet, so far, with a possible small get-together this coming fall. From reading about Ansbach and the various military units there in the 210th Group, it seems clear that the 1/75th with its obsolescent and very catankerous, hard to maintain M55 Howitzers was just an interim member of the 210th Group. Understand those M55 tracks eventually were turned over to the Budeswehr. In the 1/75th, we had essentially five batteries: Hq, Service, A, B, & C ... As a nuclear capable unit our alert posture was very stringent -- no off duty travel beyond 2 hours, field gear always packed & ready to go, etc. We had monthly alerts, usually at 0-dark-hundred in the middle of the week and would move to the Urlas (local training) area outside town for a few hours, then back to Hindenburg to clean up, eat breakfast, and start the training day. Annual Battery and Battalion tests were held at Graf and it was always a major operation to load those 50-ton tracks on German rail cars for the move to & back from Grafenwohr. There were 4 M55's per battery 12 in the battalion) plus a SWEL (Special Weapons) van that carried our 8" nukes and training nuke rounds. Re-supply and maintenance of anything nuclear was at Heilbronn Depot. Always very unwieldly security convoys to accompany any moves of the nukes. Looking back, it always amazes me to think that we had those nukes in our battery area all the time, lightly guarded and with no PAL protection to prevent unauthorized use. There were several SW tests each year -- I was "A" Battery's SW Assembly Team Chief -- from the DA-IG team, from 7th Corps, and from Sandia Base. On more than one occasion, we used the real nukes for the assembly & disassembly tests...scary, now that I think about it! These were alternate assignments to the regular artillery tours with 1/75th in Ansbach; Korea (1/21st FA Bn, 1st Cav in 1964-65 just before it converted to 1st Cav (Airmobile) and deployed to RVN; then 2/19 Bn, First Air Cav in RVN in 1967-68; and finally command of the 3/319th FA Bn, 101st Abn Division at Ft Campbell 1976-77 which tour included a REFORGER back to Germany.